The concepts of yin and yang are central to Chinese religion and philosophy as a whole, including both Taoism and Confucianism. Moreover, the symbol itself is familiar worldwide to many people regardless of their knowledge of the Chinese traditions. These two principles represent the primal interplay of opposites in life and in the world - known here as the Tao. They form the dynamism of the Tao, or the way of all things. Life is lived inside the interplay of opposites: up and down, hot and cold, male and female, dry and wet, outside and inside, high and low, joy and sadness, peace and war, exertion and rest, life and death, and so on. Yin and Yang symbolize this interplay that is at the center of life's dynamism or energy. They are, thus, the energy of the Tao. About the only oppositional pair that would not be included in this symbol would be Good and Evil, at least not in the ultimate, "capital letter" sense of the words. The Tao and its primal interplay of opposites is all fundamentally Good, according to Chinese philosophy and religion. Things may appear good or bad (lower case letters) in the immediate or short-term sense, in that things are experienced as either good or bad for our lives. However, in the grand scheme of things, even "bad" things are Good; they are not Evil. For example, a volcano may erupt killing many people and animals, and burning large amounts of forest. This is certainly "bad" for those who are killed; however, in the larger scheme of things, the volcano's eruption creates new structures and life forms through the expulsion of the earth's energies. The same is true for wildfires, earthquakes and other natural disasters which are deadly, to be sure, but which also are healthy for the earth in the larger view. Yin and Yang symbolize this primal dynamism and malleability of the Tao, or the way of all things. This is the way of the universe - there are good times and bad, a time to live and a time to die, a time to be happy and a time to be sad, and so on. These are inclusive of and complementary to each other. Harmony in life comes when we accept the working and rhythms of these polarities. Other sacred texts and teachings express this theme as well - it is not unique to Chinese religion. 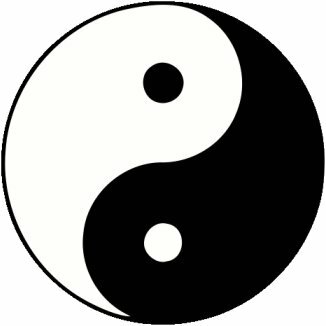 The Yin and Yang symbol, however, is distinctly Chinese.